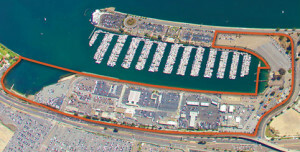 The Port of San Diego is looking for a developer to transform a 57-acre land and water site that is now a rental car parking area adjacent to Harbor Island. Proposals are due by Dec. 29 for the site, which encompasses 44 acres of land and 13 acres of water. The port said proposals may include restaurants, public open space, hotels and maritime-related uses. “This property offers a rare occasion for one or more developers to re-imagine commercial, community and recreational space that has the potential to become iconic in the region,” the port said in a statement. The land is currently used by three rental car companies, which are preparing to relocate to a consolidated facility in 2016, as well as aviation-related industry and the Harbor Police Department Headquarters.